بني فندق ميلبورن لودج في 1980، وهو يعتبر ميزة مُضافة للمدينة و خيار ذكي للمسافرين. يقع مركز المدينة المثير على بعد 0,3 km فقط. إن سهولة الوصول من الفندق إلى المعالم السياحية الشهيرة الكثيرة في المدينة هو استثنائي بحد ذاته. إن الخدمات الممتازة وحسن الضيافة العالي في ميلبورن لودج تجعل إقامتك تجربة لا تنسى. يمكن الاستمتاع بمجموعة من الخدمات على أعلى المستويات في الفندق كمثل واي فاي مجاني في جميع الغرف, تخزين الأمتعة, واي فاي في المناطق العامة, موقف سيارات, انتقالات المطار (من أو/و إلى). في الفندق غرف نوم يتجاوز عددها 34، كلها مجهزة بعناية وجمال وبعضها مزود بـ مواد تنظيف, شاي مجاني, سجاد, قهوة فورية مجانية, تلفزيون بشاشة مسطحة. سواء كنت من محبي الرياضة أو كنت تتطلع لتفريغ عناء نهار صعب، ستجد خدمات ذات مستوى عالي بانتظارك كمثل سبا, حديقة. يشكل ميلبورن لودج بخدماته الراقية وموقعه الممتاز، قاعدة مثالية للاستمتاع بإقامتك في المدينة. This was a great place to stay. My partner and I got the first room downstairs which backs onto the communal court yard. So the only downside was the people in the courtyard talking until 2 in the morning. Other than that it was a lovely place. The staff are great and the rooms very clean. The place is nice and warm. Walkable distance to the lake and city center within 10 minutes only. Breakfast is served to guests here before our journey to Mt. Cook and Lake Tekapo. Highly recommended. Loved our stay at the Melbourne Lodge. Staff were friendly, room was comfortable, big bed, nice shower. Wifi worked well. The continental breakfast was also delightful. Great views outside the lodge. I would definitely come back. We stayed in a 2 bedroom suite. It had a very large dining table, but only 1 sofa for sitting other than the dining chairs. We had a wrap around balcony that had a view of the roof but also of the lake, There was parking, but it was limited and not easy to get out of. It appeared there was also street parking. They very graciously allowed us to check in quite early. We used the brand new BBQ to cook our dinner. Breakfast was fine and was served by the sweetest young woman. Downtown is just a few (steep) blocks away. This place was twice as expensive as anywhere else we stayed in New Zealand (hence the 3 stars), but maybe that's a QT thing. Great staff: happy, friendly & accommodating. Straightforward, clean, comfortable rooms and ample facilities for a solo traveller or couple passing through. My single room was exactly as shown in photos: bright, airy, clean with a nice comfortable bed and new hand basin. No queues for shared facilities which were kept clean and tidy by staff. Light continental breakfast included was more than satisfactory for this style of property. Room rates were ok (bearing in mind it was Christmas so everything in QT had horrendously overinflated prices compared to usual). It was a peaceful place to stay, easy to find, just a short walk up the hill from town, and only a few hundred metres from the bus stop outside the Millennium (which gets you to everywhere you need to go). I will be back. It's a great cute place. The room was cozy and really clean. The toilets and showers were very clean too. The breakfast was delicious and they have a good wifi. Also, the location was great, just a few minutes walking to the town. I would say there again if I ever went back to Queenstown. I had a lovely stay here for 8 nights. The staff were lovely and very helpful. 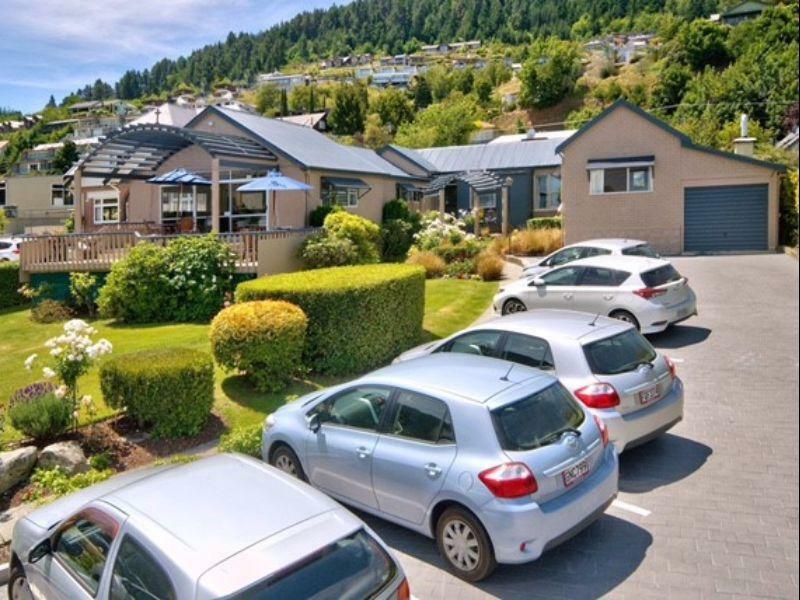 It was a great place to base myself for Snowboarding at Coronet, Remarkables and Cardrona as well as day trips and ease of access downtown to restaurants ans supermarket. i think the location is just so-so. not far and not close to the center. there are more choices you can make when deciding where to live in queenstown. people who live here usually are not young people. Clean room and near to the center. However, breakfast could be improved with more options. the room is nice, spacious for 4 people. the breakfast is really nice. the staff really friendly, nice, informative,very helpful. Great place for the money you pay, simple but comfortable rooms, close to town and good breakfast. The view, the cleanliness and the breakfast. Its just one night stay for us, overall is good. the room is nice and big. they provided utensils, a microwave and other little stuff. The bathroom and nice, clean and the shower has excellent pressure. The staff were lovely and one day the girl was was able to give me some breakfast the night before as I had a tour that started at 6am. They have beautiful flowers on display and a common room where everyone has breakfast which is just lovely. The only downside was, the electric blanket was not working (but I had not inform them of this fault) and the motel is located on a big hill making it a difficult climb to and from the town centre which is very close by, however there is parking on site. I will be back again. Thank you! The B&B has a not bad location. Within a walking distance (about 15 minutes), you can reach the downtown area of the Queenstown. Its convenience. The room and staff are ok. But don't expect the room has excellent lake view. In sum, its value for money and located at a quite good location. I only stayed one night and was really pleased by how comfortable and affordable (compared to the rest of accommodations in Queenstown) this place was. Breakfast was a real buffet too! I had a single room close to the bathroom, all spotless clean. Great view from the breakfast room and lounge. Overall I would recommend for solo travellers looking for reasonable and comfortable accommodation. Bed was too soft for me but the wife loved it and the shower was temperamental they were the only negatives. The room was good, clean and quite. The staff were great, helpful and friendly. Close to town only a short climb back to the lodge but very handy as parking in town isn't free. If going to Queenstown again would definitely stay here again.